Pours light golden color. Flavor of malts, yeast, caramel and sugary sweetness, spices. Medium body, alcohol gets through a bit too sharply. The balance is actually quite good, but there are some odd flavours at play. Strawberries and paper with a hint of vegetables in the front, then fading to a second bite of toffee and black coffee. It’s not terrible, but I can’t imagine buying it again. Tap at SOPP Hki 2017. Smell of banana, yeast. Weizenbock-like smell. Hazy golden colour, small white head. Aroma of banana, hops, malt. Also some sugar. 500ml bottle (thanks Pihtla). Mistyvamber color. Small size, white bubbly head, stays. Papery, caramel, sweet in aroma. Sourish, caramel, papery, Belgain yeast in taste. Belgian yeast and papery and bready in aftertaste. Alcohol is kind of hidden. Drinkable brew. 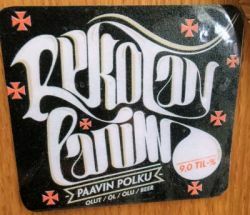 Bottle from Alko Kovoula Finland. Lasting white head over a cloudy golden color beer. Sweet and malty taste and aroma with a distinct potatoes peels. A firm bitterness. Bottled at TEJA tasting. Hazy golden, small head. Chalky nose with pineapple and potato meal. Sweet with full body and dense, rounded mouthfeel. Syrupy, bready with pineapple and banana. Low bitterness. American 90-s style sweet, syrupy tripel. Vähäkusinen, mutta siihen nähden hyvä loppumaku. Jotain outoa oli maussa. Ei osaa sanoa. An slightly orange beer, a head is small and blond. Aroma is mild and quite strange, no Tripel there. Vegetables and fruits, earthyness, mud. Taste has earthyness, only hint of fruits, vegetables, mud, quite bad. Medium bodied. Horrible beer, this is rare to me, but now it’s true, over the half of the bottle is pouring into sink. Bottle from Alko. Hazy orange with medium head. Yeasty, some fruity, mild bitterness, some alcohol bite.